There are big God of War spoilers ahead, HUGE. So don't read on unless you want to know all about God of War spoilers and details of the ending. It's basically a God of War cheat sheet, filling you in on all the details, but even if you have finished the game there could be things here you've missed so you have been warned. Okay, so you really want all the God of War spoilers do you? Maybe you haven’t got time to play it, or you’re just really impatient. Either way we’re going to really, really spoil everything now. This is your last chance to get the hell out if you don’t want to know some of the biggest twists in the game and the final ending. Most of the game sees Kratos trying to defeat the Stranger, who’s later revealed to be the Norse god Baldur sent by Odin. He’s invulnerable to all damage until Atreus accidentally stabs him with one of the mistletoe arrows that had been given to him by Sindri. That undoes the spell protecting Baldur and lets Kratos kill him in the final boss fight. Worth noting that in the classic myths, Baldur comes back from the dead after Ragnarok so we might not have seen the last of him just yet. 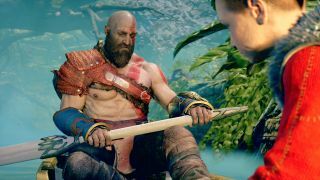 Very early in the game Kratos meets a witch who helps both him and Atreus. Eventually it's revealed she's actually the goddess Freya, and the mother of Baldur. She's the one responsible for his magical invulnerability, which is why she gets angry about Atreus’ mistletoe arrows and destroys them. She’s also pretty upset about her son’s eventual death, and her final threats make it sound like she'll be back later. In classical Norse mythology she's also responsible for Baldur returning after Ragnarok. This is the big one: Atreus is Loki. This is something you find out right at the end of the game when you reach the giant realm of Jotunheim and discover murals explaining all. Here you discover Kratos’ wife was a giant all along without anyone knowing, and had foreseen everything that happened in the game. She also originally wanted to name Atreus Loki before going with Kratos' choice of Atreus (a famous Spartan general). So Atreus, or Loki, is half god and half giant. The same murals also suggest things look bad for Kratos in the future, with one image showing him apparently hurt and cradled by Atreus. There are callbacks to the old God of War games. Most importantly, Kratos gets his old Blades of Chaos back when he journeys to Hel to help save a sick Atreus. He's also reunited with both Athena and Zeus via flashbacks and visions. The meeting with his father even perfectly recreates the final moments of God of War 3, where Kratos beats Zeus to death in first person. The fact that Kratos might be the Norse god of war Tyr is something the game seems to suggest several times. Tyr has a vase with Kratos on and some wine from his homeland, for example. He's also meant to be wise, peaceful and is clearly presented as everything Kratos is trying to be. He's also suspiciously nowhere to be seen in the game. Instead, there are a lot of interesting clues: Tyr was a big friend of the giants, which you would be if your son was one. Tyr also helpfully leaves a puzzle behind for Kratos that only Mimir can solve, almost as if Tyr knew he'd be there. Atreus also links the two gods at one point by saying that both Tyr and Kratos are good, unlike almost all the other gods. So how could this be possible? When Mimir talks about how the events of Ragnarök sent the world serpent back in time, Kratos scoffs very noticeably. And, not only does the world serpent mention someone looking familiar when they initially meet, but the true end of the game suggests Ragnarök is near. The events of that could see Kratos thrown back in time to eventually become Tyr in the past. That then opens up the possibility of God of War games set in Egyptian, Chinese or Mayan cultures as teased by director Dory Barlog and shown in Tyr's vault. There's a set of credits that roll in-game once you’ve scattered Kratos’ wife's ashes in Jotunheim, leaving you free to wander the world and finish off all the side missions. However, to see the true ending you'll have to return home and rest in Kratos’ bed. When you do you'll trigger one final cut scene where Thor appears on Kratos' doorstep before the final, final credits roll.